THE BAD NEWS: Eight out of ten furniture stores do not know how to set their own sales teams up for success. A very high percentage of retailers do NOT even have professional sales people... they have order takers. Most stores with order takers would do better to place "Take To Cashier" tags on their merchandise. Most stores do not have REAL sales managers and coaches. Believe it or not, most stores do not have a selling system/sales training program. THE GOOD NEWS: If you have an ineffective salesperson or sales team, there is a great opportunity for you to obtain large sales increases. THE SCENARIO: Consider a four-legged stool. If one leg is missing, it will not stand properly. If two are missing, forget it. Like a four-legged stool, proper and effective retail sales teams have four strong supporting legs. I am sure you've heard the phrase, "Plan, execute, review & coach". This phrase describes an effective sales team. First, there is a plan... a sales training selling system. Second, the salesperson executes the plan with customers. Third, there is a review of the results. Finally, there is the 4th leg, which is coaching. Just like a four-legged stool, if any leg is missing in your store’s selling processes, sales will fall short of their potential. Most stores can achieve huge sales increases just by moving their sales teams from the realm of the ineffective to the effective. The sales process is a four-step process... plan, execute, review and coach. Let's look at each of the four steps. The plan is a selling process or system that is engineered and designed to make a sale. The best selling system for the home segment -- furniture, appliances, electronics and flooring -- is a trust based, non-manipulative, no pressure, controlled, relational selling system. A selling system is a choreographed sales process that starts at the greeting and proceeds in a planned, proactive and intentional manner all the way through making the sale and post-sale follow up. A great selling system overcomes all objections before they occur. And a great selling system maximizes the foot traffic opportunity presented to your sales staff. If your store does not have a selling system, shame on you. In fact, a store comprised of 10 salespeople with no pre-set selling system may actually have as many as 20-30 different selling systems because the salespeople change what they do throughout the year. When a salesperson is in a slump, they change what they do. In addition, a store with no selling system will experience a very wide range of salesperson performance. This means that each customer will receive a different experience in your store depending upon who greets them at the door. Have you ever had a friend or acquaintance walk into your store and you said to yourself, “I hope Katie is up. I sure don’t want Jimmy helping them.” My question is…WHAT IS JIMMY DOING GREETING ANYONE if you don’t believe in his abilities? Great sales training programs are based upon the law of cause and effect. This law states that if you find a successful high achieving sales professional and you duplicate what he or she does, you will achieve similar results, with the only variables being attitude and tenure. After a salesperson is trained to master each step in a selling system and understands the rationale behind each step, she is ready to execute the plan "live" with customers. There are two facets to the review process. First review the sales performance metrics, Then review or observe the salesperson's interactions with the customers. Precedent Metrics: Performance metrics are split into two very distinct categories, precedent and dependent. Dependent metrics are called dependent because they depend upon something happening; these metrics are the end results. Precedent metrics are called precedent because they measure the cause rather than end results. If coaches focus on proper causes as measured by precedent metrics, effects will take care of themselves. Key Point: Dependent metrics are derived from sales and traffic numbers. Precedent metrics are derived from observing the salesperson. The most recognized retail performance metrics are dependent sales performance metrics such as sales volume, traffic, average sale, close percent, hours worked, sales per hour, items sold, average items per ticket, and average item retail. Most retailers capture some if not all of these, but stand-alone, this data is not very useful in coaching performance improvement. 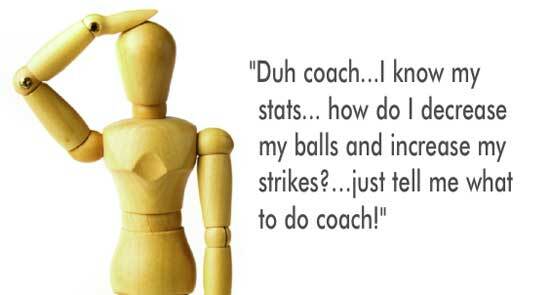 It is difficult to coach from dependent metrics alone. They provide insight regarding what to look for when observing a salesperson’s interaction with customers, but it is the measurement and coaching of precedent metrics that creates real performance improvement. Many sales managers tell me they are coaching when in fact, they are simply reviewing dependent sales reports with the sales staff. Reviewing performance numbers is NOT coaching. Passing out reports is not coaching. Coaching with dependent performance metrics is frustrating for the coach and equally frustrating for salespeople. And, it creates no long lasting performance increase. Consider a baseball pitching coach who solely focuses on Jimmy and his high ERA, low strike count, high number balls & bases on balls and their unacceptable wins and losses rather than the skills that cause these undesirable numbers. WARNING: The cure is not in "yelling and telling" the dependent reports and stats. Imagine a pitching coach saying, "Jimmy, you need to reduce your balls and increase your strikes." Jimmy will say, "Duh coach...I know my stats....how do I decrease my balls and increase my strikes?…just tell me what to do coach!" A pitching coach observes all key facets of a pitcher’s delivery... things like release point, stance, windup, foot alignment and shoulder alignment. All of these nuances affect where balls pass over home plate. Each little change at the release has a big effect. A pitcher’s precedent metrics might include his percentage of early releases. If the pitcher releases the ball too early 45 percent of the time, the ball will often miss the plate. Lower the precedent early release metric of 45 percent to say... 25 percent and the ball will hit the strike zone more often and the STRIKE COUNT WILL RISE! Notice I said "Will rise" not "Might rise, could rise or should rise." This IMPROVEMENT is based on the law of cause and effect. Think... precedent equals skill and dependent equals results. Coaches, therefore, need to coach precedent skills in order to change dependent results. Just like there is real science in pitching, there is real science in selling. In sales, precedent metrics are the identification and quantification of performance of the key skills in a selling system. If these precedent steps are performed well by a person they will see an increase in their dependent performance metrics such as; sales volume, average sale, close percent etc.. The secret to coaching is to track, measure and coach precedent skills. Let’s consider the greeting as the first sale a salesperson must make. If successful, salespeople sell themselves and stay with the customer. Imagine you have a salesperson who has a high customer disconnect rate at the door. This salesperson gets released by using the phrase “Just Looking” a high percentage of the time. In order to help her, the coach should observe how the salesperson is greeting customers. Then she can be taught to avoid greetings that elicit the automatic customer response of “Just Looking”. Most salespeople greet a customer by saying something like, “Can I help you?” These or similar greetings will create a high disconnect rate. In this greeting example, the precedent skill can be measured simply as a behavior or skill that did or did not happen. How the salesperson greets will change the dependent metric which is the disconnect or “Just Looking” rate. So, here is a takeaway for you and your sales team… let’s change the greeting to “What brings you in today?” This greeting phrase will cut the disconnect rate by 40-50% or more. The precedent skill is using the correct greeting. The law of cause and effect states that they will LOWER their disconnect rate by making this simple adjustment. Ah Ha MOMENT: Therefore, an improvement in a precedent skill metric WILL improve the dependent metric, in this example the "Just looking" disconnect rate. And, when trained properly, the other dependent metrics such as sales volume, average sales, etc., will also increase. Ah Ha MOMENT TWO: Your job of coaching is made impossible if you do not have a sales training or selling system. The system defines skills or steps in your selling process. The system is the precedent behavior or skill that obtains the desired dependent end result. If you have no sales training system in place, you will be left floundering and unable to affect real performance improvement. Coaching is comprised of three things. Observing the salesperson, reviewing dependent and precedent performance metrics and teaching the skills and rationale behind each skill. Coaching is made easy when there is an effective selling system and there is sound precedent and dependent performance tracking. In the "Just looking" example above, the sales coach simply coached TWO THINGS. First, the coach taught the salesperson a different greeting. Second, the salesperson was taught the rationale behind changing that greeting. Just like the pitching coach coaches the ball release point and the rationale behind that release point. Your job as a coach is to get the pitcher to understand that changes in the release point will help to improve the ball's trajectory. Reference the chart showing actual sales results achieved at retail by utilization of the proper greeting discussed in the example. The dependent metric is the disconnect or “Just Looking” percent. The precedent metric is the percentage of utilization of the proper greeting. It shows a 60-day view; 30-days prior and 30-days after teaching the appropriate greeting to the sales team. When the proper greeting is utilized, the disconnect or “Just Looking” rate plummets. In summary, a poor coach “yells and tells” the salesperson to improve his or her greeting disconnect rate. This inappropriate coaching is focused on the dependent metric, the disconnect rate. A good coach observes how the salesperson greets customers and then asks him or her to use a more effective greeting. This good coach is focused on the precedent metric, the proper greeting percent, the cause.